This has to be one of my all-time favorite party themes. Brittany of Grey Grey Designs designed this for a special 1st birthday. 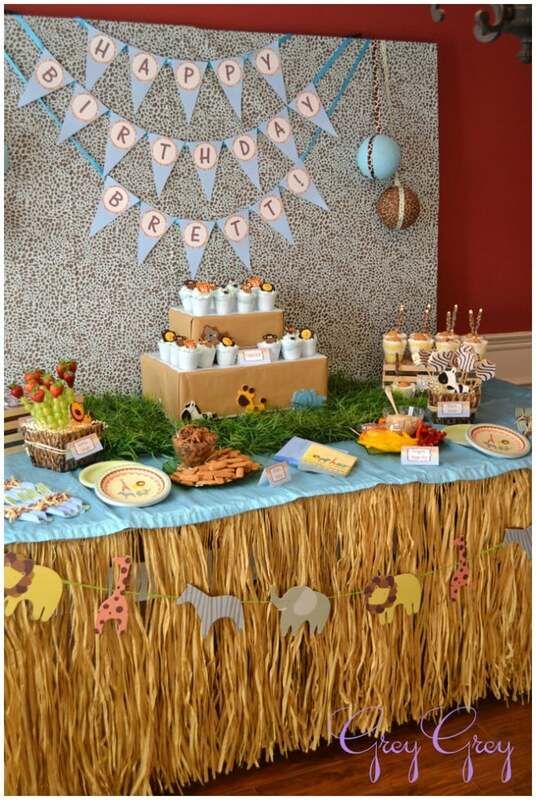 She created the party with a palette of light blues, animal prints, raffia, baskets, and touches of yellow and green. She found a light blue leopard print fabric at Hobby Lobby for the backdrop of the party. She also found green grass mats in their Easter decor section – clever! 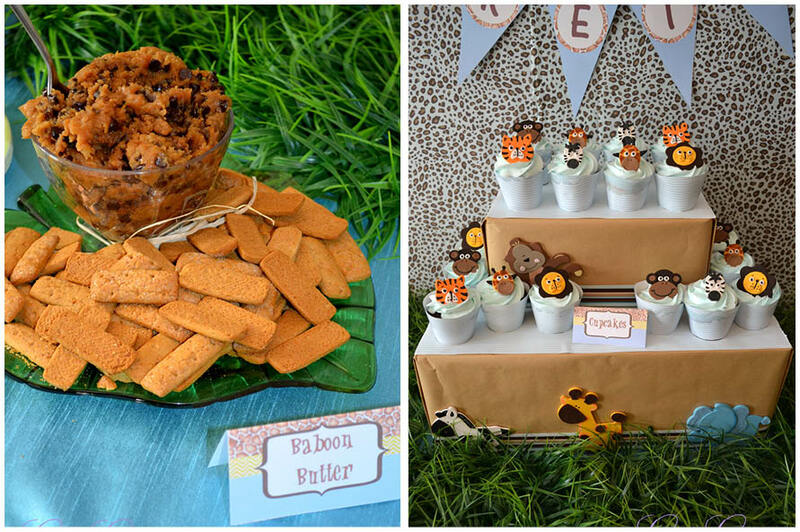 Brittany did a great job of adding thematic touches to the entire party – we love how she wrapped the forks in leopard print crepe paper and tied with raffia! It’s always the little things that send a party to the top! The mini banana pudding cups are darling, and Brittany wrapped the spoons in the leopard print crepe paper as well! Clever! 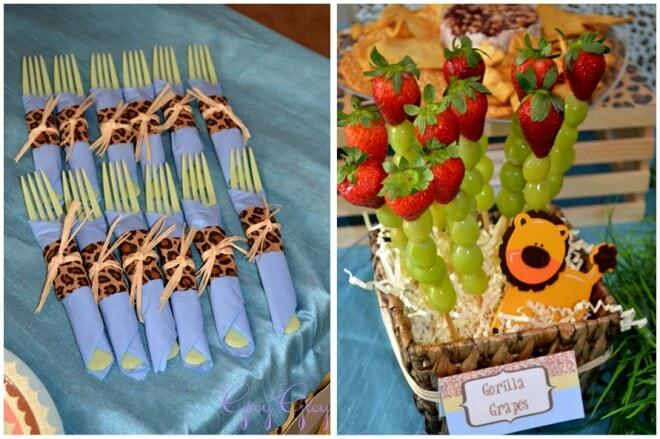 I also LOVE the “gorilla grape” skewers to add some healthy fruit into the mix of sweets! You might be wondering what “Baboon Batter” is, huh? Well, it’s peanut butter, chocolate chips, and bananas, served with graham cracker sticks! Yum! Brittany crafted her own cupcake stands with cardboard boxes, wrapping paper, and ribbon. The little wooden animals are from Hobby Lobby as well. The fondant toppers on the cupcakes are some of the best I have seen. Cookie Covers on etsy created tall the cupcake toppers! For lots of additional pictures, visit Grey Grey Designs! 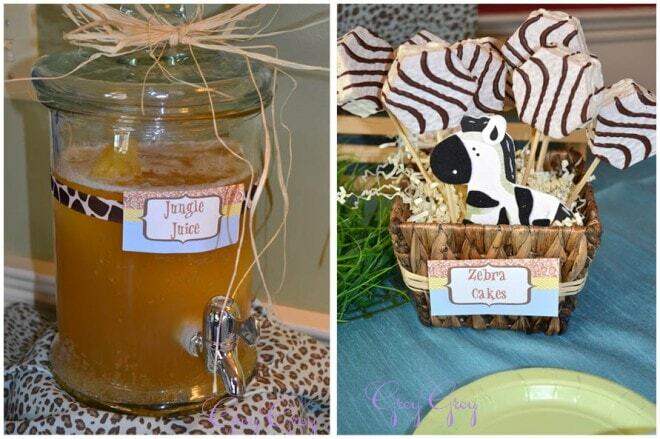 For lots of Jungle + Safari invites, stationery, calling cards, address labels, and note cards, visit our paper store! 3 Free Greeting Cards from Tiny Prints! I really love this party! So, so many great details & I love the menu. She did the dessert table look without gobs of sweets. Creative & smart!! 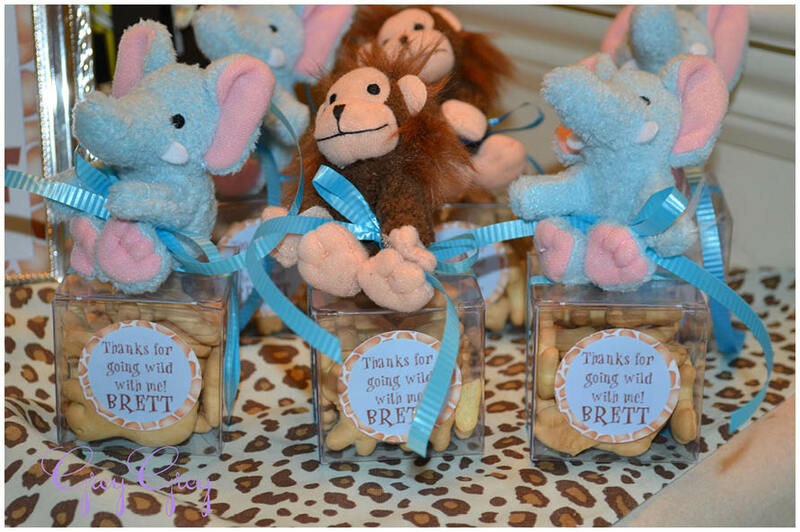 This party is a favorite of mine–love all the little thoughtful details! This party is awesome! 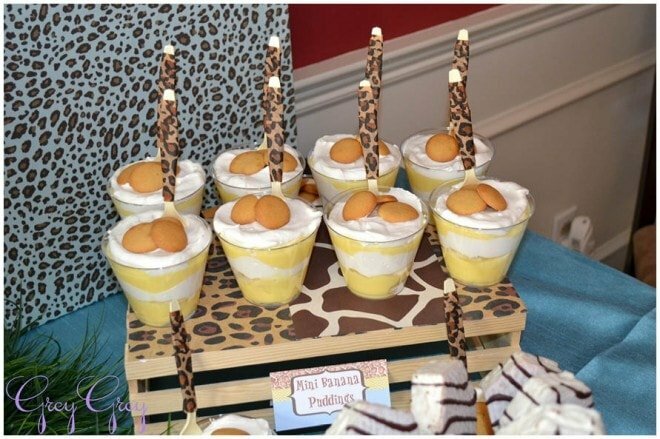 Love everything, especially the banana puddings and the zebra cakes (my hubby’s fave). She has great style for sure! Wow! Welcome to the jungle! What a fun theme for a first birthday! Over the top details and so fun for the kids! Thanks for sharing! Very cute party! Love all your ideas! Cutest Birthday theme ever! 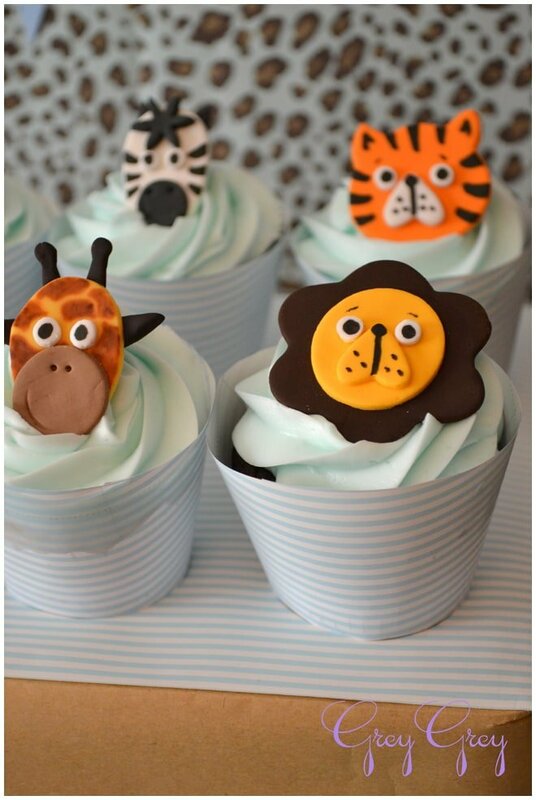 The animal cupcakes are to die for! So cute and clever! Adore this theme, love all the detail without being to in your face.